We are neighbors in Atlanta, runners, obstacle course racers, and outdoor enthusiasts who have property and financial management backgrounds. We are also dog owners and active members of our community. We love exercise and being in warm climates which is why we have this amazing home. We pride ourselves in providing great customer service and want everyone to enjoy their time while relaxing with family or friends. This location is perfect if you love to relax by the pool, hit the beach or hit the nightlife of Fort Lauderdale and Fort Lauderdale Beach. Easy access to and from I-95 and the airport. We are constantly updating the house to keep the house well-maintained and desirable. We just updated the kitchen, bath,repainted, and the less interesting but important, plumbing! We want everyone to feel at home, relax, enjoy the sun, the backyard, the quiet, the serenity, and simply enjoy themselves! If anything does go wrong, we have a property manager that lives 5 minutes away and will respond to any surprises. Washer and Dryer are conveniently located in the master bathroom suite! wireless throughout, very fast Comcast Xfinity internet. Password is provided in the informational booklet. galley kitchen with all the basic utensils, dishes, cups, coffee maker, microwave, stove, oven, toaster, plates, and silverware. off the back of the house between the house and the pool is a covered porch/patio with a seating area and outdoor curtains to pull if the sun is too much. Minimum Age Limit for Renters, Lots of natural light, bright rooms, hurricane windows and doors. This house was absolutely perfect. Spacious, gorgeous bathrooms/showers, super cute kitchen with a pretty large fridge - it had absolutely everything we needed. Our favorite part was definitely the back yard. The saltwater pool was AMAZING - perfectly heated and lovely. The landscaping in the yard was absolutely gorgeous - being out in that yard at night was a great experience... The lighting of the trees reflecting in the pool was a sight. The house is a very short ride away from anything you could possibly need. I would absolutely recommend this to anyone who wants to get away from it all, but still be close enough to everything to be part of the action! Excellent property with beautiful pool area. Very attractive home with large and beautiful pool area. Very attentive and cooperative owner/management. Home is very convenient to restaurants, shopping and downtown Ft Lauderdale. Two couples and two older singles rented this property for four nights over Christmas. Overall, we six were very pleased with the accommodations! Upon arrival, the property manager was at the house making sure that all was ready for our rental. He was careful to ensure we could call him for any reason. Nice touch! Only snafu was the fourth bedroom shared by one couple had a horribly squeaky box spring...so much so that we had to remove the box spring and use the mattress only on the bed frame....this solved the noisiness for them but made the bed very low to the floor. Otherwise, all other things in the home were in good working order and well kept. Certainly the property was quite clean, just a little bit worn by use. The back patio and pool were a big draw for the whole group, even the 70 somethings! Pool was kept at a nice temperature too, even for cooler December nights. We appreciated the amount of towels, the shampoo/conditioner/body soap dispensers in the showers and the paper products provided. One HUGE bonus was we found a gorgeous little Christmas tree in one of the storage closets that we were able to decorate! It made our Christmas adventure there even more special. Note: One thing for folks to remember is that the master bedroom has an en suite bath which one couple shared with the older Dad. The other bath was shared with my husband, myself and my Mom. Would love to rent this again if our plans take us to Ft Lauderdale again. Can not say enough good about this place. A great place to relax. The backyard is a paradise with a heated pool. In a very quiet neighborhood. I highly recommend if you are looking for a quiet place. Overall it was the perfect spot for a girlfriend getaway! The pool was perfect! House was clean. This was the cutest little getaway house. Though it’s in a neighborhood and there are neighbors, once you step outside in the back you feel secluded! The sun shined in the pool till the evening which was great for my sunbathing friends. It was close to all things! The blue martini is a bar nearby we closed it down! They had a band that was so fun to watch perform! We hardly were actually inside the house other than to shower and sleep but the house was clean and the beds were cmfortable! Plenty of space! If I ever come back to Fort Lauderdale, I will definitely come back to this house!! The home was very clean, the yard is gorgeous and the pool was awesome! We had to make our children get off of the pool. This home is by far the best!! No complaints!! Please note we have to manually add 6% sales tax to every stay. 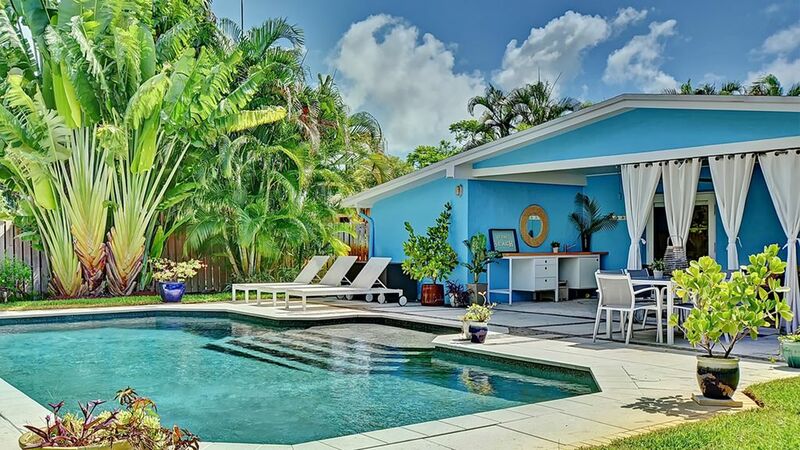 Currently, the HomeAway system will only charge for the local Broward County taxes. I apologize for the inconvenience.